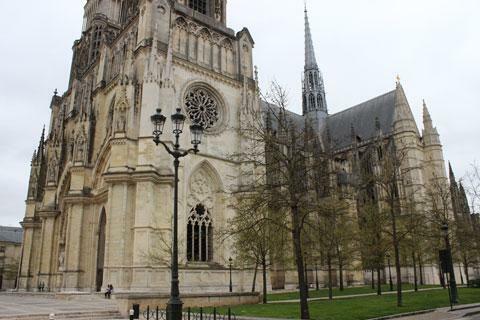 The gothic style Cathedral of Sainte-Croix dominates the city centre of Orléans, and the most photographed scene in the town is undoubtedly the lovely view along the Rue Jeanne d'Arc towards the front of the cathedral. Before visiting it is useful to know something of the history of the cathedral, and of the churches and cathedrals that previously stood on the site. It is said that the very first church was built here around 330 AD, at the dawn of Christianity in Europe. This early church also contained a morsel of the True Cross, that had been discovered in Jerusalem by Saint Helen, the mother of the Emperor Augustin. This cathedral was completed in 450 AD and, despite substantial damage caused by the Normans, survived until the late 10th century, when a great fire destroyed the cathedral and much of the town. In the 12th century an imposing roman style cathedral was built to replace it. 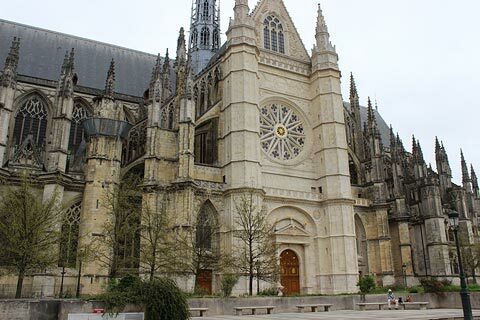 This was one of the greatest cathedrals in France, but unfortunately the ambitions of the designers was not matched by their engineering skills and the cathedral collapsed in the early 13th century. The building of the next version of Orleans cathedral started in 1278 and eventually completed in 1512. Although it kept a few parts of the earlier roman style cathedral, it was essentially built in the 'fashionable' gothic style of the period, with flying-buttresses to support the great height of the walls of the nave. This was the cathedral that stood here at the time of Joan of Arc. The Wars of Religion in 16th century France saw many churches destroyed, and a great part of the Cathedral of Orleans was destroyed by the protestants in 1568. With the signing of the Edict of Nantes in 1598 the Wars of Religion were brought to an end. Three years later, in 1601, the building of a new cathedral began, principally in the Gothic style. The building of the cathedral took until almost the end of the 17th century to be completed. In the 18th century the last remaining part of the original roman cathedral, the main entrance to the west, was demolished to make way for the imposing facade that we see today. The Revolution interrupted the work before the two towers were built, and these were only completed between 1817 and 1829. By planning or coincidence, the cathedral was completed exactly 400 years after Joan of Arc had broken the siege of Orleans by the English. It was also at this time that the area in front of the cathedral was cleared away to make room for the new Rue Jeanne d'Arc, much as we see it today. Since that time, the original belltower was replaced, and some damage was repaired after the Second World War, but the cathedral we see in Orleans today is essentially the cathedral built between 1601 and 1829. It is the western facade that is the most interesting feature of the cathedral, with its ornate stonework, 88 metre high towers and three rose windows. The highest point of the cathedral, the belltower, reaches a height of 114 metres and contains five bells varying in weight from 600 kg to 6000 kg. The exterior entrances of the transept also have interesting features such as rose windows so be sure to walk right round the outside to see all the highlights. Inside, Orleans cathedral follows a conventional design with a main nave that is 140 metres long, four side naves, a transept and the choir section. The grey stone gives a rather sombre look to the high columns and arches. The area behind the choir, the deambulatory, has some interesting stonework and decoration. 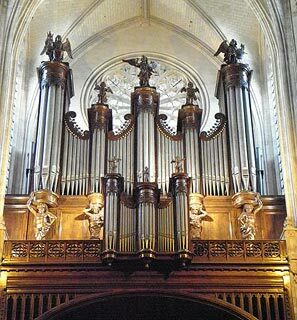 The organ was brought here in 1822 from the Abbey of Saint-Benoit-sur-Loire and has been restored several times. The stained glass windows, although mostly quite recent additions to the cathedral, are also interesting, in particular those that relate events from the life of Joan of Arc. Since little of the original cathedral from 1429 now remains, the windows act as a useful reminder of the events and history that have taken place here over the centuries. You will inevitably enjoy exploring the centre of Orléans at the same time as a visit to the cathedral, since the main highlights of the city are all very close to here. Enthusiasts of religious architecture will want to visit the Abbey of Saint-Benoit-sur-Loire to the east of the town to see the 12th century roman style architecture, and if you take an excursion in the other direction you quickly reach the castles of the Loire Valley: the Chateau de Chambord is the first major castle you reach. You can find more local travel ideas in the Loiret guide and the Loire Valley guide.